Cocker Spaniels make excellent family dogs and companions. The breed is a smart, loyal, and happy animal. Because of their intelligence, Cocker Spaniels are quick learners that are able to pick up new tricks easily. Are you thinking of bringing a puppy home to your family but unsure where to begin with training? Learn how to train a Cocker Spaniel here! A Cocker Spaniel’s temperament is known for having level-headed personalities and being affectionate. The devoted breed loves doing everything with his family. Although Cocker Spaniels are soft and cuddly, they are quite active dogs. Cocker Spaniels have a hunting instinct that they inherited from their ancestors. You may find your pet with his nose to the ground trying to track things from time to time. Another common personality trait of Cocker Spaniels is their sensitivity. They may cower or shy away from angry owners, which should be taken into account when considering the best way to train your Cocker Spaniel. Without proper canine socialization, the breed will become timid and will not respond as well to training and obedience lessons. An adequately socialized and trained Cocker Spaniel puppy will be a pleasure to be around. Cocker Spaniel puppies quickly bond to their owners. They are joyous, trusting, gentle animals who add plenty of fun to their household. As the Cocker Spaniel has gained popularity, improper breeding techniques have led to some genetic problems for the breed including “rage syndrome.” Unreputable breeders who breed from unscreened dogs may keep Cocker Spaniel puppies in poor living conditions without any socialization. Before adopting a puppy, it’s important to research reputable breeders and select someone you can trust. If you notice that a Cocker Spaniel pup is notably fearful or timid at the breeder’s kennel, it may be a good idea to select a different dog. These personality traits may be a sign of a poorly tempered dog that will be difficult to train. A Cocker Spaniel puppy from a trusted breeder will be even-tempered which makes the training process much more manageable. 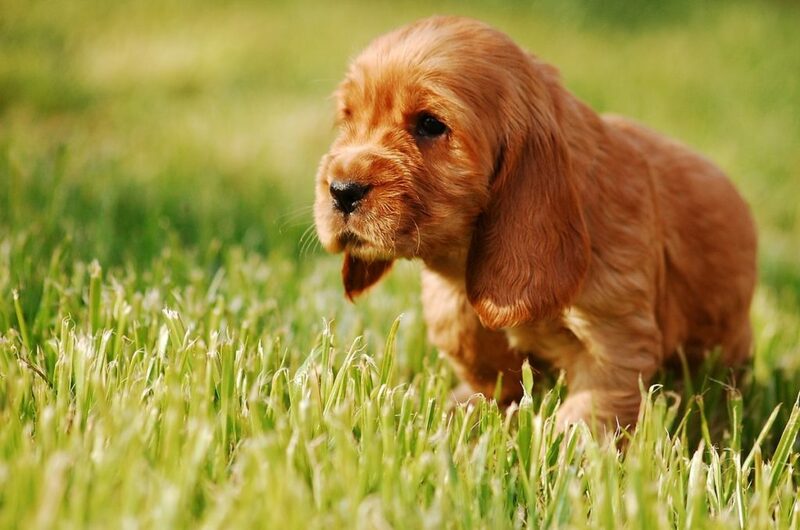 Starting the Cocker Spaniel training process early will ensure your puppy develops into a well-behaved adult dog. In fact, you’ll have the best result if you begin training your Cocker Spaniel puppy the day you bring them home from the breeder. Keep reading for more detailed information on how to train a Cocker Spaniel. The key to house training a puppy is to start the process early on and be consistent. Create a puppy house training schedule and stick to it! A crate can be a valuable tool for housebreaking when you want to potty train a puppy. The ultimate goal is to prevent accidents and reward good potty behavior. Many pet owners may be wary of confining their puppy to a small space, but crate training for puppies is an effective way to housebreak a Cocker Spaniel. A properly sized crate will be just large enough for your pup to stand up and turn around in. If the crate is too big, your Cocker Spaniel may think it’s okay to go to the bathroom in the corner. Getting your dog accustomed to a crate will also be helpful for vet appointments and traveling. The basic idea behind using a crate to house train a Cocker Spaniel puppy is that dogs are instinctually clean and don’t want to soil their living quarters. When your pup has to go, they will notify you by scratching or whining. When you notice these signals, take your dog out immediately. The first step to crate training a Cocker Spaniel puppy is to introduce them to the crate and create a positive association with being inside. You can make the crate more inviting and cozy with blankets, towels, or a dog bed. Placing the crate in a common area of your home will make your pup feel like they’re still part of the family. The first time your Cocker Spaniel pup goes inside the crate, leave the door open so they can sniff around and get comfortable. Leaving toys or treats in the crate can be helpful if your puppy is resistant. After introducing your Cocker Spaniel puppy to the crate, you’ll want to get your pet comfortable with staying inside for longer periods. A great way to do this is to have your dog eat meals inside the crate. Place a bowl of food right inside the crate the first time and move it further back with each meal. Once your dog is content eating meals in the space, try closing the door. If your pup begins to whine, leave them inside for shorter periods and build up slowly. Eventually, your Cocker Spaniel will be comfortable enough in the crate for you to leave the house. Leash training a puppy is another critical aspect of raising a well-behaved dog. Although the breed is somewhat small, Cocker Spaniels are strong animals who like to pull hard on their leashes. It’s never too early to begin leash training a puppy. The first step of Cocker Spaniel leash training is getting your puppy familiar with wearing a collar. Lightweight leather collars are perfect for leash training puppies. Put your dog’s collar on while they eat or play. This will distract from any discomfort. Most pups will roll around and try to get the collar off the first few times, but it’s vital that you don’t remove it right away. Wait until your Cocker Spaniel has settled down and forgotten about the collar before you remove it. Once your pup is used to wearing a collar, you can introduce the leash. A thin, lightweight leash works well for Cocker Spaniel leash training. Clip the leash onto your puppy’s collar and let them drag it around the house for a little while and get comfortable with it. When your Cocker Spaniel is used to having a leash attached to his collar, you can pick up the other end. Begin by walking together around your home and work up to short walks outside. Cocker Spaniels enjoy the physical and mental stimulation of obedience training. It’s an excellent opportunity to spend quality time with your pet and begin the bonding process. Puppy obedience training schools are excellent for the training and socialization of Cocker Spaniels. Pups should learn basic commands including “sit,” “down,” “come,” “stay,” and “heal.” These commands will be a great help in keeping your dog safe and in check in many situations. Luckily, Cocker Spaniel puppies pick up obedience commands very quickly. When your pup has mastered a command, don’t stop practicing it altogether. As you move on to other commands, it’s essential that you continue to practice each basic command. This will allow the training to really sink in. Like all dogs, Cocker Spaniels are creatures of habit and thrive on routines. Developing a consistent, structured training plan will make your pup feel secure. Once your puppy learns that certain things happen at specific times, they will be less stressed and more responsive to the training process. A young Cocker Spaniel’s daily routine will usually consist of sleeping, eating, playing, training, and socialization. Once you establish a schedule for your pup, stick to it! Consistency is key. Using positive affirmations to reward your Cocker Spaniel for good behavior will teach your dog that good things happen when he behaves. In turn, positive reinforcement will lead to more good behaviors. When your Cocker Spaniel doesn’t receive the same positive feedback from you when they misbehave, your puppy will be less likely to repeat the bad actions. A simple, but firm “No” will also work. Harsh punishments and intimidation tactics will be ineffective for training. Since the breed is known to be sensitive, Cocker Spaniels may shy away or lose confidence with harsh feedback. Positive affirmations during puppy training may include a small doggie treat, a belly rub, vocal praise, or access to their favorite toy. Rewards should be given to dogs immediately after they exhibit positive behaviors. To avoid distractions, Cocker Spaniel training should be done in a quiet area where you won’t be interrupted. Young pups will get distracted by noises, TV, other pets, and family members. It’s important that your puppy focuses on you and the task at hand. When the training process progresses, you can start introducing some small distractions. This will develop discipline in your Cocker Spaniel and strengthen the commands you teach them. Cocker Spaniels excel in many physical activities and love agility training, flyball, tracking, and hunting. Some Cocker Spaniels enjoy digging which can become a big problem if they aren’t adequately trained at a young age. Some pet owners provide their pup with a designated area in their yard for digging. A young Cocker Spaniel’s attention will start to wander during a training session, so it’s best to keep them short. Effective Cocker Spaniel training will focus on repetitive, reward-based methods. Puppy training sessions should be quick, focused, and fun. This will keep your dog interested, alert, and most receptive to commands. Remember to be consistent with rewarding good actions and always correct your puppy when they slip up. Allowing your Cocker Spaniel to get away with unwanted behaviors will confuse your pup and hinder the training process. Ending each training session on an upbeat note will teach your dog that training is a fun, positive experience.